When Katherine Lau — Katie to her friends — graduated from Palo Verde High School, she knew she wanted to study biomedical engineering and use her skills to help others. Now at Rutgers University, the state university of New Jersey, Lau comes home for her summers. For her 2014 summer break, she looked for a research project in which she could be involved. 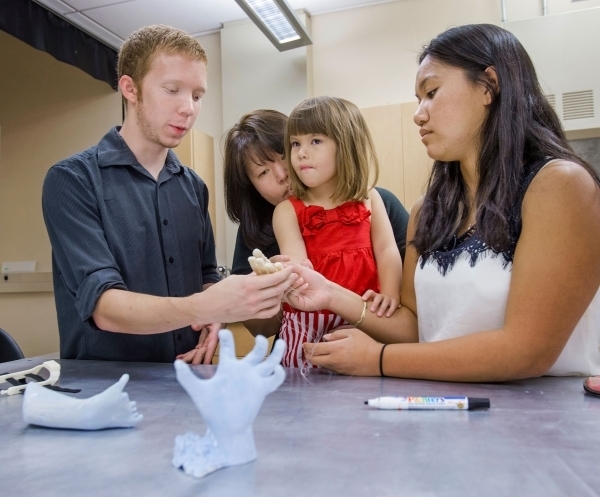 UNLV professor Brendan O’Toole selected her to be part of a small team for a research project: creating a prosthetic hand for a 4-year-old who’d been born with only a partial thumb and pinkie on her right hand. A prosthesis would cost in excess of $20,000, the family was told. But 3-D printing brings that cost way down, to hundreds of dollars. The initial prosthetic hand was made using 3-D printing. Now, that child, Hailey Dawson, 5, of Henderson, is ready to be outfitted with her next new hand. Hailey, who is in kindergarten at Lamping Elementary School, was born with Poland syndrome, a condition that causes the pectoral muscles to be underdeveloped and, sometimes, hand abnormalities. 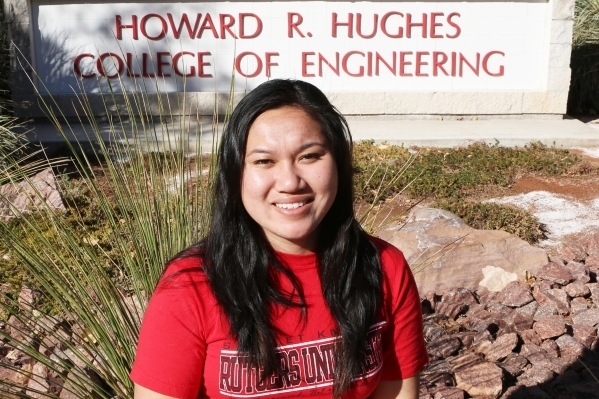 The new version — the UNLV group calls it the “Flexy-Hand 2” — will use the design and protocols that Lau, who is busy with her studies at Rutgers, and her team devised. 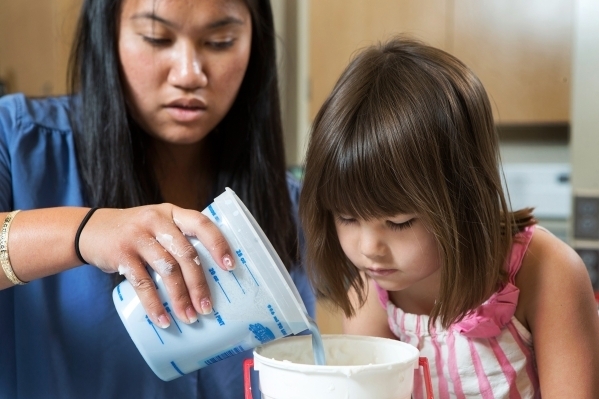 What was it like to make a prototype for the toddler? Lau also had to figure out a palm design that meant not reprinting the fingers each time to be even more cost-effective. Meeting Hailey brought home why the task was so important. A mold of Hailey’s hand was made using a fast-forming substance, similar to the substance orthodontists use to make impressions. Lau and the undergraduate students at UNLV met with Hailey about five times that summer. The final time was to secure the prosthetic hand to her arm and ensure she could manipulate it. The tyke took to it immediately. Hailey calls it her “special hand,” said her parents, Gregory and Yong Dawson. Hailey received the first Flexy-Hand around Halloween 2014. Like any young child, she broke it within 15 minutes of getting it home. The type of hand operates in one motion. There is no individual finger movement. What’s life like for Hailey now? O’Toole said UNLV has been involved in 3-D printing for about 10 years, mostly for prototypes and components, fixtures and models, but making a hand was one of the more inventive ways to use the technique. It takes about a week to print Hailey’s prosthetic hand and a couple of hours to assemble it. The hand comes out of the 3-D printer off-white, so it’s painted a flesh tone to appear less obvious. Sometimes, though, Hailey and her parents don’t mind it being obvious. On Aug. 18, she threw out the first ball before the A’s-Orioles game at Oriole Park at Camden Yards in Baltimore, using her Flexy-Hand. Whatever color it’s painted, designing the Flexy-Hand will always be a fond memory for Lau, she said. “For me, it was life-confirming that I chose the right major and that this was what I wanted to do (as a career),” she said. She expects to graduate in spring 2016 but will stay at college to complete her master’s degree. Her dream job, she said, would be in research and development. — To reach Summerlin Area View reporter Jan Hogan, email jhogan@viewnews.com or call 702-387-2949.